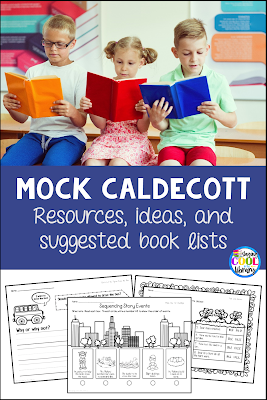 What is a Mock Caldecott? One popular activity that many libraries do around this time of year is a mock Caldecott election. A mock Caldecott is simply where students read and vote on which book they think should receive the Caldecott Medal. There are many ways to do a mock Caldecott from simple to complex. I am going to explain two ways I have done it in the past just to give you an idea. I am also going to give you two different book lists. The first is a list of the books that I think are excellent contenders for the 2019 award. The next list is books that I feel would do well to use as part of a mock Caldecott. This second list has both new and older titles. I chose books that I thought might be part of most school library collections and ones that I feel meet the requirements of earning a Caldecott. This is just a guideline of course. You can use whatever books you would like. Click here to download the book lists. 1. 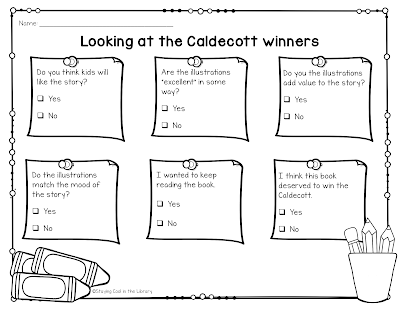 Choose the dates that you want to hold the mock Caldecott. This depends on how many books you want to use and how you want to run the election. I generally take about 2-3 weeks. 2. Choose the grade levels you want to do this with (2nd and 3rd work well). 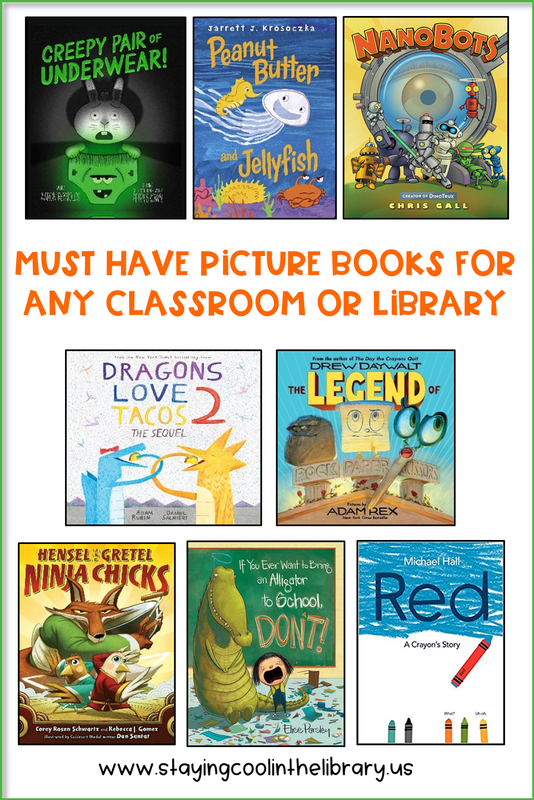 Before you begin make sure to remind students that they are not choosing a book that is their favorite or that has the coolest pictures. They are choosing a book whose illustrations does the best job of telling the story. 3. 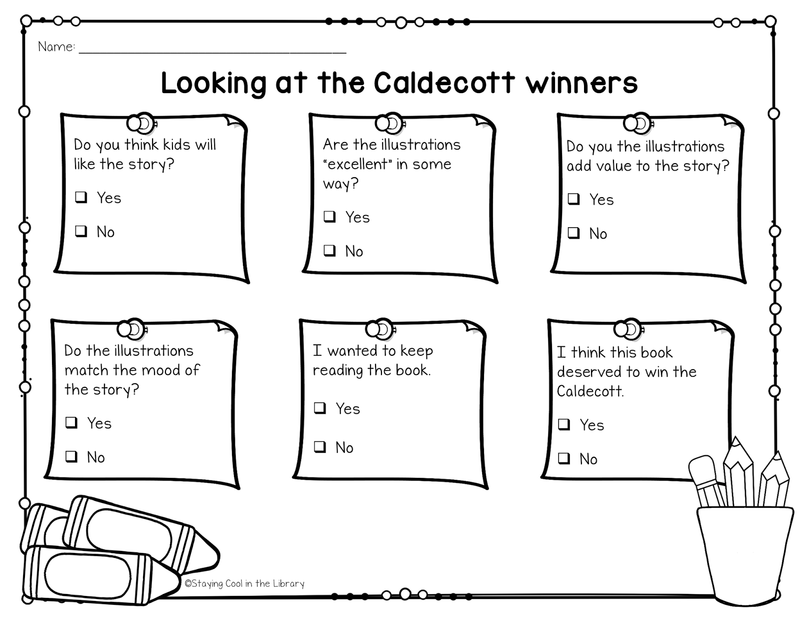 Once you decide on the books you want to use for your mock Caldecott you will need to print off the ballots. The way I do this is print off blank copies of the Caldecott ballot (the same one that is in my Caldecott Resource Pack). Then as the students read the books (or after I have read the books to them) they will fill out the ballot. They will fill out a ballot for each book. 4. Once the books have been read and the students have filled out their ballots, they will record the results on their tally sheet. Then you will review the tally sheets and find out which book the class chose as their favorite. This book is the winner of the Mock Caldecott Medal. The books that came in second and third place are the Honor Books. 5. Once the winner is decided you can have the students fill out the graphic announcer "Introducing the Winner". I like to put these up on display and show the books that were used for the mock Caldecott election. Try to collaborate with the art teacher (if you have one in your school). Ask the art teacher to review some of the different illustrating techniques that are frequently used in picture books. Show students a video of a past announcement of the Caldecott winners. Send letters home to parents explaining the Caldecott Medal and the mock Caldecott election. You can also hold an assembly to announce the winners or if that's not possible to announce the winners on the morning announcements. 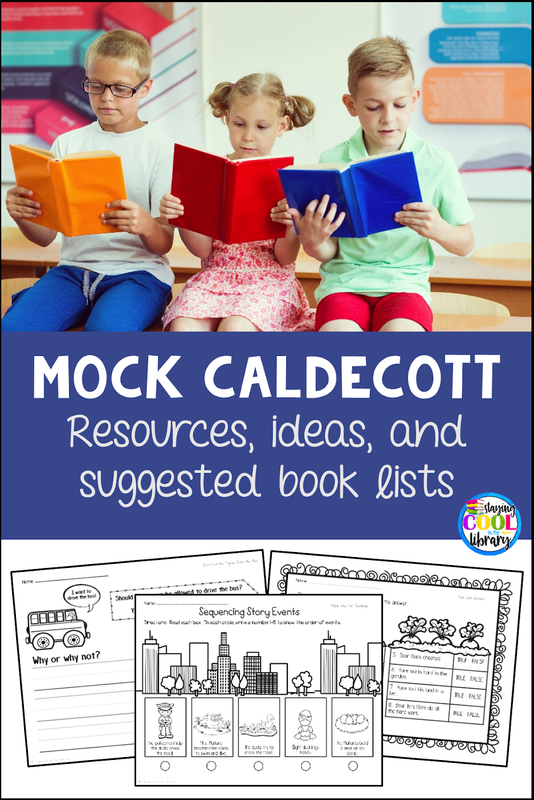 Choose the books you want to use for the mock Caldecott. Create a ballot with the names of the books that you are using for the election. Place the books around the library. Number each book with a sign. Make sure the numbers on the signs match the numbers on the ballots. Then have students rotate around the library and look at the books. If you chose only a few books you might be able to get this done in one class period. The fewer students you can have in each group the better. It's more difficult if you have five or six students trying to look at one book at the same time. Use a timer so students have to move on to the next book when time is up. When students get to the last station they will fill out their ballots. They will simply number the books with 1 being their favorite, 2 their second favorite etc. Tally up the results. You can do this as a class or you can collect the ballots and present the winners to the class the next time you see them. You can have students fill out the graphic organizer or create a poster showcasing the winning book from each class. If you would like to check out my Caldecott Medal PowerPoint and Activities you can find it on my website or in my TpT store. 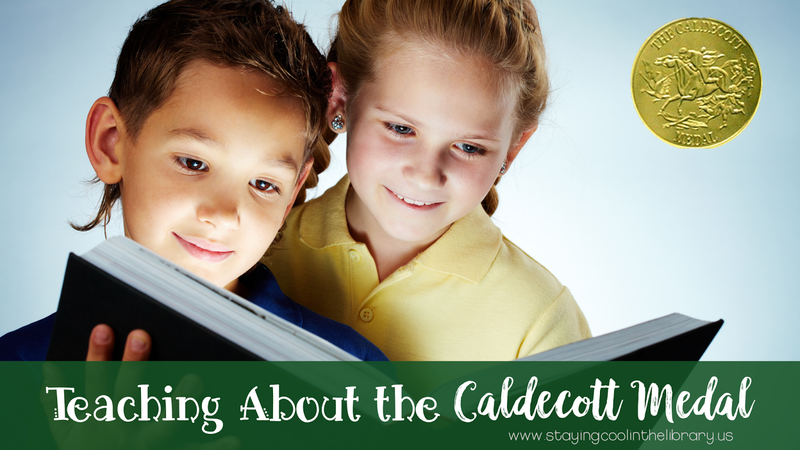 What is the Caldecott Medal? Very important: The first thing you want to do is pull all of the Caldecott and Honor books in your library. You will need these books as you go through your lessons. And once you begin talking about them with students, they will all want to check them out. I begin by telling students that they will be learning about a special award given to picture books. It is an award given to a book with really awesome illustrations. That may be oversimplifying it a little bit, but that is how I begin. I then will go into more detail about how a book is selected. 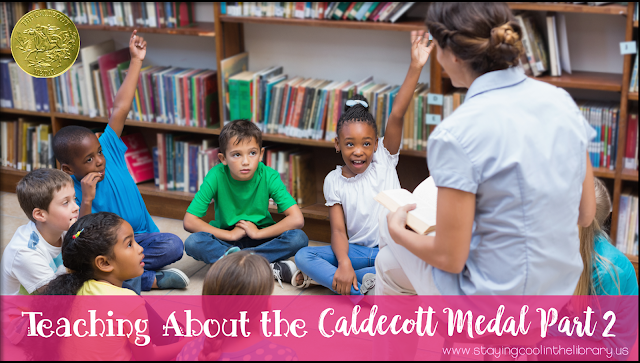 This is when I put up the PowerPoint presentation I created about the Caldecott. I will also explain about the Honor books. The Honor books are ones that came in second and third place. No more than 5 Honor Awards will be given out. Next I will list some books that have won the award, specifically ones that I think the students will know. This helps give the students some context as they begin to think about these books and their illustrations. These include: The Polar Express, Where the Wild Things Are, Officer Buckle and Gloria, Don't Let the Pigeon Drive the Bus and Creepy Carrots. Typically by this point in the lesson I am out of time. Depending on the class I might put some of the Caldecott books out on a couple tables for the students to look through for the rest of their library time. The second day is when I let students look at all of the Caldecott books that I have pulled and begin to think about why these books were chosen. I feel it's important that the students have the chance to look through as many books as possible. This allows them a chance to see different types of illustrations and how the illustrations have changed over the years. I begin by putting several books out on the tables in the library. When students come in I have them each find a seat and explain the activity. 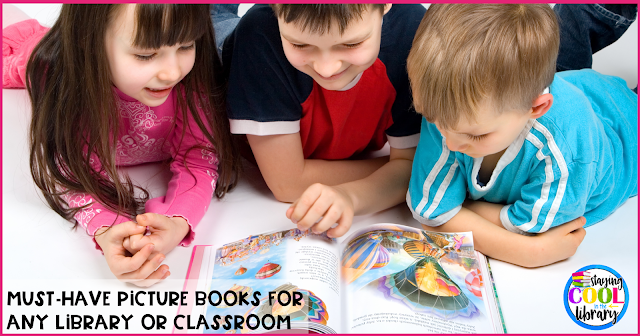 They will be given time to look through the books and choose one that they really like. Then they will fill out the graphic organizer about the book. I put the organizer up on the SmartBoard for them to see as I go over it. There are six different questions they will need to answer based on the book they chose. These are yes/no questions. I made simple so more students in different grades would be able to fill it out. As an extension, you can have students write more detail about why they answered one of the questions or draw a picture from the book. This is an easy way to differentiate, especially if you use it with students in older grades. After the students have had time to fill out their sheet we will take some time to go over their answers. Another idea that I have used before is to give multiple copies of the same book to students. For example (2 tables have Owl Moon and 2 tables have Last Stop on Market Street). There are a couple reasons for doing this. One, if you need students to work together for some reason this makes it easier to do that. And it saves on time. It is quicker to go over the graphic organizers if the same 2 books were used and students won't get as distracted as they work (wanting to look at everyone else's book). **This graphic organizer is available for free. You can download it by clicking on the link at the bottom of this post. After I have completed the first two lessons, I spend the next few weeks reading individual books and then doing a companion activity. You can spend as much or as little time on this as you would like. In my Caldecott Activity Pack I have included several worksheets and graphic organizers to go along with some of the past winners. You can use these or come up with your own activities. I also have a pinterest board of activities to go along with different Caldecott books. You can find my Caldecott Medal PowerPoint and Activities in my TpT store and on my website. If you want to read about my predictions for the 2019 Caldecott Medal click here. One of my favorite parts of being a librarian is adding new books to the collection. I spend hours looking through all the publisher catalogs, reading reviews and new book lists. I order most of my books through Titlewave and they have some amazing tools and resources. And when the books are delivered I'm like a little kid on Christmas morning. But the sad reality is, I always end up with a book list totaling thousands of dollars more than what I can actually afford. So then I spend many more hours paring the list down to get the most "bang for my buck". Since I do spend so much of my time doing this, I thought I would share some of the books that I feel are "must have" for any elementary library or classroom. Most of these books are ones that my students have really loved. They are not necessarily award winners (although some are) but ones that engage students, make them laugh, make them think and most of all make them want to check them out. 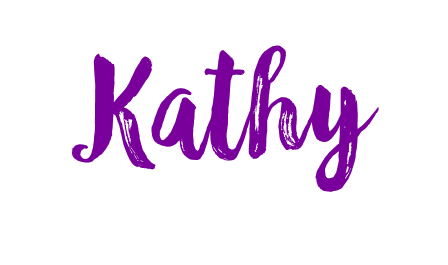 Since this list could easily have a thousand books on it, I decided to write several blog posts including picture books, chapter books, series and nonfiction. Of course there are books that overlap and can be on several lists. And I am only including books that have been published in the past three years (for the most part). What are some of your favorite picture books? Leave a comment below and tell us. Next I'll give you my top choices for chapter books and series. 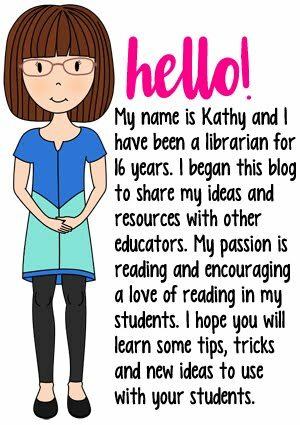 Become a member of the private Staying Cool in the Library Facebook group for librarians and educators.